For an easy and delicious breakfast try making this sandwich, inspired by one of my old Houston haunts, Brasil. Fry some bacon, fry an egg—in the bacon grease, naturally—and set aside. Cut a couple slices of sourdough bread; in this case I used a sourdough bâtard—a thicker, wider baguette—from Whole Foods. On the sourdough, slather as little or as much mayonnaise as you'd like. 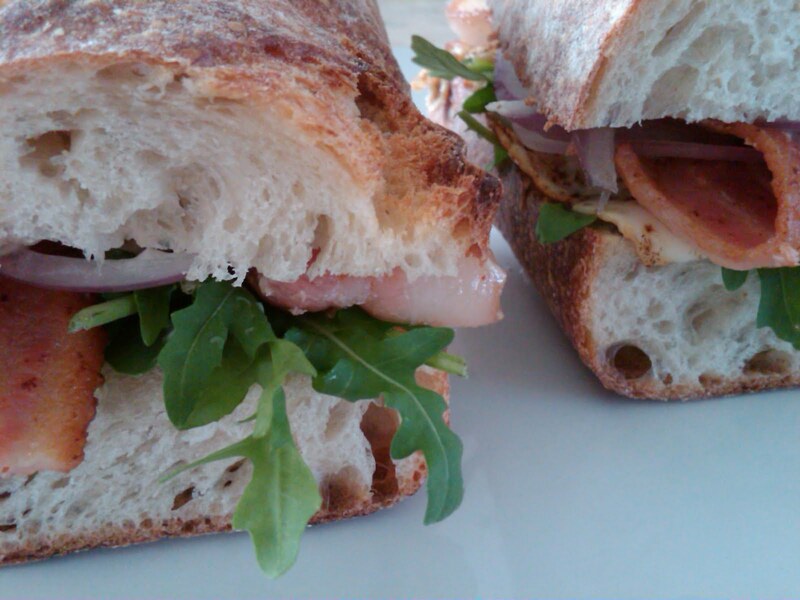 Top with a bed of arugula, the fried egg, the strips of bacon, and thinly sliced red onion. You're done. 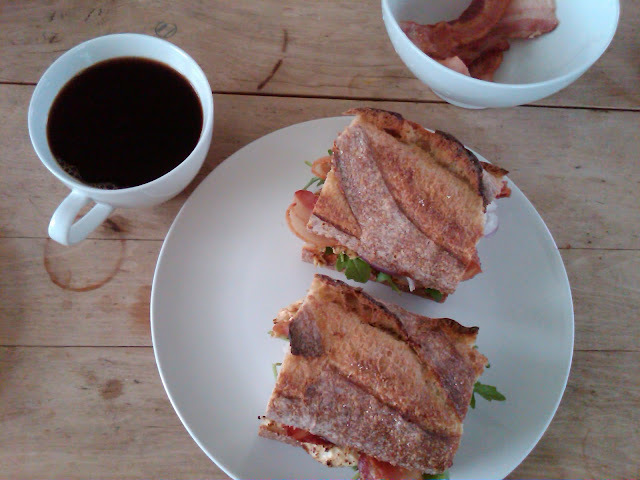 This sandwich goes well with black coffee (in this case, a cup of some kind of Venice blend from Groundwork Coffee Company) but then again I can't think of any Western breakfast foods off the top of my head that don't go well with coffee. Los Angeles, California – February 11, 2010 – Recycle-A-Flask takes the nation by storm and launches its recyclable flasks in stores across the country. The reaction so far – people love it! Two things the consumer has been leaning towards over the last year – going green and saving money. Recycle-A-Flask achieves both goals. With its FDA-approved plastic, these flasks are safe to drink out of and are safe for the environment because it is recyclable. With such a low price point, Recycle-A-Flask is very affordable for all types of consumers, whether a user is looking to fill it with alcohol, or even the hiker that needs a light, compact unit to tote juice or water. Sure, it holds the same amount of liquid as does a metal flask and weighs slightly lighter, but if you lose this flask, it’s not such a big deal because it was so cheap and likely had no sentimental value attached to it. This is not a replacement for that metal flask with your initials engraved on it – well, it just may be if you got your metal flask confiscated – rather, Recycle-A-Flask is an affordable, usable, green-happy alternative. Recycle-A-Flask can be found at your local liquor store (and if not, it will be soon!) For a list of retailers who currently carry Recycle-A-Flask, check the company’s website at www.recycle-a-flask.com. 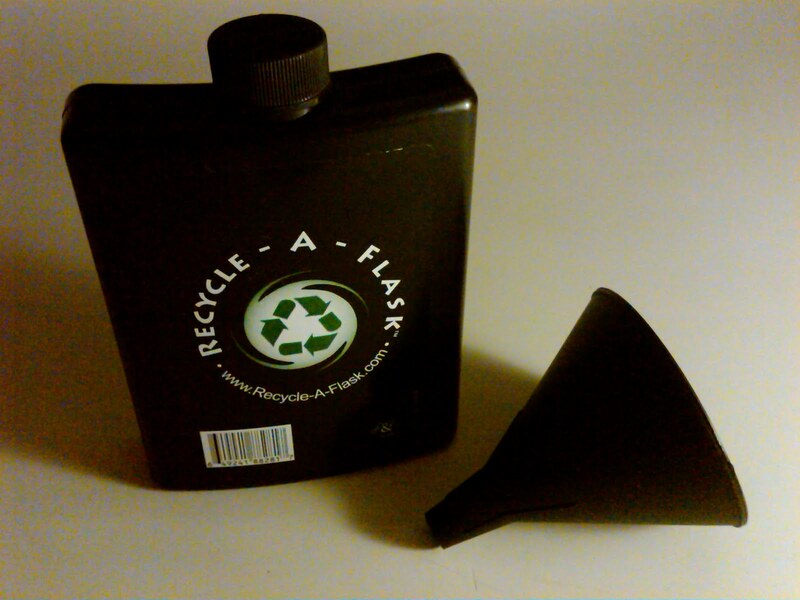 Recycle-A-Flask, a division of 1966 Productions, LLC, is a California-based company. I hope for your sake that your local liquor store starts carrying these soon. Since Thursday is the first day of fall, I call this post the Summer Show Wrap-up. It is composed of poor quality concert footage taken with my not-so-smartphone for your viewing and/or listening pleasure. The first show I saw after moving to Los Angeles was Caribou, in May, at the El Rey Theatre, but I was too busy dancing to film it. So we begin with Night Gallery. Night Gallery are my friend from high school, Adam Griffin, and his musical partner "Aaron-David." They were originally based in Chicago but Aaron-David has since moved to New York. While I don't write about music (I listen to it and recommend it and make the occasional mix CD) I will say that it has a heavy '80s feel and makes you want to wear thin, patterned shirts with shoulder pads and dance on your toes. Think The Knife, but released from the dungeon. Dead Man's Bones is heartthrob (well that's what he is!) Ryan Gosling's band with Zach Shields. This show, officially called "A Special Evening with Ryan, Zach and the Kids" was one of the best shows I have ever seen. "The Kids," who, on this particular night, named themselves something like "A Warm Glass of Milk" are the Silverlake Conservatory Children’s Choir. The venue, the Center for the Arts in Eagle Rock, was decorated like a high school dance, complete with streamers, balloons, and folding tables around the perimeter covered in baked goods, and popcorn and cotton candy machines. The audience was asked to be seated for the duration of the show, which included magicians and puppeteers and of course, Dead Man's Bones' spooky yet exhilarating tunes. Then there was Leslie Feist on Saturday night at the Hollywood Bowl, floating around on stage with her hands in her skirt pockets, singing "Two Weeks" with Grizzly Bear. This was followed by Phoenix, but like with Caribou, I was too busy dancing—on the bench—to film anything. Until today, I'd always scrambled eggs in a hot skillet—fast. Today I loosely followed Mark Bittman's recipe for Best Scrambled Eggs and found that this (much) slower version—an estimated 40 minutes—over low heat, produces a much softer and creamier scramble. By the way, this recipe is from the original How to Cook Everything, or The Big Yellow Book. It has been rewritten and is now The Big Red Book. I used to follow recipes religiously. If I didn't have all of the ingredients or equipment exactly as specified, I wouldn't do it. But one of my roommates, who makes cookies without an electric mixer and substitutes this for that has inspired me to be more flexible. 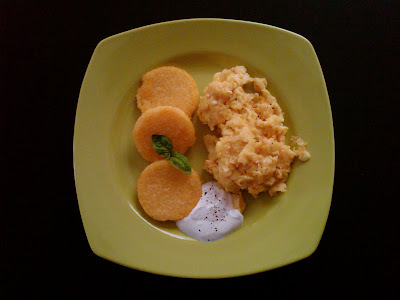 For this recipe, because I was cooking for one, I used 3 eggs instead of 5, kosher salt because I love it, skipped the tarragon because I don't have it and used a tablespoon of milk instead of 2 tablespoons of cream because I don't have that either. 1. Place a medium skillet, preferably non-stick, over medium heat for about 1 minute. Add the butter and swirl it around the plan. After the butter melts, but before it foams, turn the heat to low. 2. Beat the eggs with the remaining ingredients and pour into the skillet. Cook over low heat, stirring occasionally with a wooden spoon. 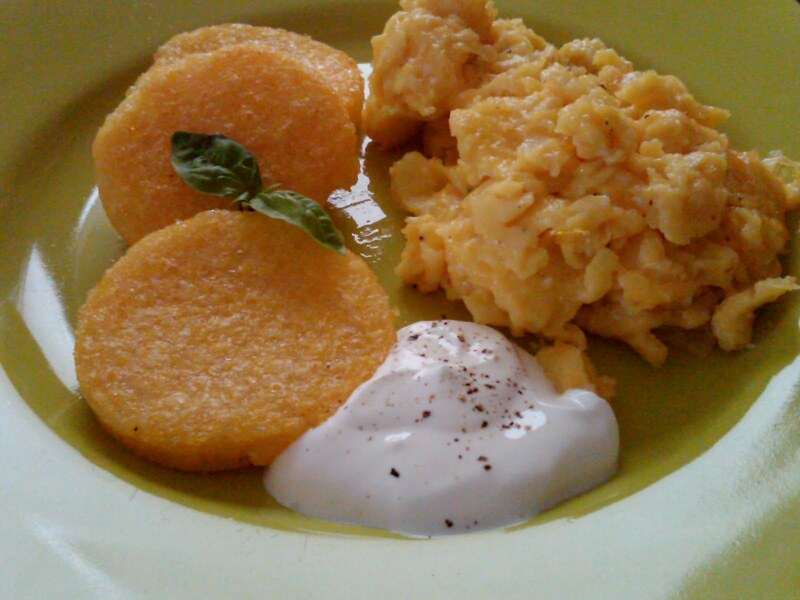 At first nothing will happen; after 10 minutes or so, the eggs will begin to form curds. Do not lose patience: Keep stirring, breaking up the curds as they form, until the mixture is a mass of soft curds. This will take 30 minutes or more. Serve immediately, with lots toast. Did you misread "toast" as "roast" like I did? Mark Bittman's writing sounds like a friend in the kitchen: "At first nothing will happen," "Do not lose patience." The time it takes for the eggs to form curds is good for pan frying a few slices of Trader Joe's organic polenta with some olive oil on a neighboring burner. 4-5 minutes on each side is sufficient. A dollop of sour cream goes well with both the polenta and the eggs, and a sprig of basil looks good in photos.